I. Smart Phones, MK Ultra, Google, CIA, Pentagon, Skynet, Artificial Intelligence, and JADE HELM. With JADE, a military planner can build a preliminary force deployment plan, including the Time Phased Force Deployment Data (TPFDD) in less than one hour. This speed in plan construction is possible because JADE supports the rapid retrieval and reuse of previous plan elements for use in the development of new plans. In addition, JADE employs an easy to use map-oriented drag and drop interface where force modules (FMs) from previous plans (cases) whose force capabilities and composition match the requirements of the current situation can be dragged from the case library and dropped onto a geographic destination. Plan modification and/or adaption is supported through remindings, e.g., each time that a force module is created or is copied into a plan (TPFDD) the user is automatically reminded of the need for geographical changes. With support from the Defense Advanced Research Projects Agency (DARPA) and the Air Force Research Lab (AFRL), JADE researchers have been able to apply academic research to an area of military operational planning and scheduling. JADE is a solution to the challenge of rapidly producing force deployment plans and is currently available for transition to the operational military planning community. This report describes JADE, its current status, and the results of two recent efforts to transition JADE to the operational environment, e.g., JEFX 2000 (Joint Expeditionary Force experiment) and ACOA (Adaptive Course of Action). In researching the MK ULTRA programs and their various offshoots, I came across an interesting connection to the coming SmartGrid. Under Dr. Ewan Cameron, a prison tracking device known as the Schwitzgebel Machine was utilized to monitor inmates locations, heart rate and other personal details that were reciprocally transmitted to the good doctors. What comes to the fore is the similarity with the development of the Smartphone and its new capabilities for monitoring heart rate, health, etc., as well as basically anything else. Is there a connection between mind control and the coming A.I. takeover? In my analysis, the rollout of the great technological utopia we are being sold was not the result of mere organic market forces that competed to produce harder, better, faster and stronger products. The average libertarian, for example, believes this deception, presuming the “invisible hand” of the market results in a natural advancement, while any other economic model retarded growth and “progress.” On the contrary, much of the technological progress we have seen in the last few decades is not the result of independent, competing ideas, but is rather the strategically timed and intentional release of the military industrial tech complex, given to an idiot public for the purpose of long-term enslavement and depopulation. With all that madness in mind, when we consider the Smartphone, we see a device that utilizes RF and tracks your every move, desire and taste, with all of that data being transferred to mysterious third parties which are sold and stored in vast data centers around the globe. “We’ve talked about Palantir before and the impact it is having on the Army intelligence community. What we didn’t go into as much was the fact that In-Q-Tel was an early investor in the technology on behalf of the Central Intelligence Agency. Palantir makes software that integrates data together from a wide array of resources and databases. The same establishment that is publicly determined to destroy humanity en masse and implement the A.I. kill grid is rolling out their designs even faster than we “conspiracy theorists” expected! In fact, this week mainstream news is reporting that IBM’s Watson, the famed Jeopardy-playing A.I. bot will play a role in determining health care! This week the BBC is reporting that a Swedish firm is offering employees to be RF microchipped, and the wage slaves willingly complied. I have highlighted the microchipping plan as something decades old, which shows the rollout of all this is clearly planned years in advance and is not an organic market development. It is with the microchip that we can see the clear connection between the mind control programs of MK ULTRA and the rise of the A.I. grid, as well as the mind control of marketing employed in selling everyone on this trap. 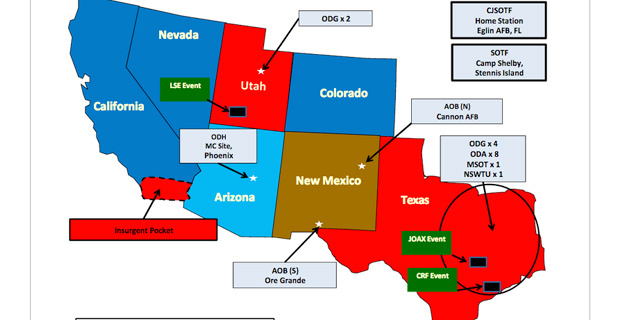 Editor’s Note: Reports so far detailing the nature of Jade Helm 15 indicate that this is the largest yet in training scenarios putting the United States population in the role of the enemy. Taking place over the course of months, it stages ‘disloyal’ Southwest states and various other locales as potential sites of insurrection and conflict. It may be the biggest pre-play yet of the coming federal-state showdown, and the apparent crackdown on dissidents and other enemies of the state that would be seen under martial law. Already, preparations for riot police to take on civil unrest have played out in the Ferguson riots and the tense atmosphere between police and protesters alleging excessive force and racial targeting. The use of a black site was uncovered in Chicago, where police conducted off-the-books interrogations and suspects were held without due process. In the background, training has taken place on American soil to detain U.S. citizens deemed “enemy combatants” and take on all-out civil unrest. These military and Homeland Security drills – and police actions – have been matched by the legal language of the NDAA and frequent political rhetoric attempting to normalize a United States of Black Bagging – a path of repression and tyranny that does not easily turn backwards. As I was working on a report concerning the existence of nationwide rendition centers known as black sites, I was sent a video, from multiple people, made by Aaron Dykes and Melissa Melton filming black helicopters yesterday in Texas (see video below). This video validates many reports that I am receiving about preemptive arrests of dissidents notated as “enemy combatants” in preparation for Jade Helm 15, and this is what I believe the two reporters are witnessing. The dress rehearsals include, “abducting” drill volunteers as these people disappear to a black site for two days and then are released. One member of the staff at The Common Sense Show has also received a similar report, but to date, nobody has had the courage to go on the record. I went through a number of my sources who I thought would have inside information. One source has confirmed that extractions of known dissidents, designated as “enemy combatants” will take place before a declaration of martial law. It is clear to me that this is what we are seeing in the Dykes-Melton video. The landing of these helicopters is likely simulating prisoner transfers to waiting vehicles which will complete the transport of a known dissident to a black site. If on the other hand, if the helicopters were a part of a more standard military operation, we would see corresponding military activity on the ground. The Dykes-Melton video does not show any corresponding military activity. People in Texas and Florida should also be on the lookout for simulated SWAT team raids which would be a part of this activity. This has captured the attention the media in Utah, as I am appearing on a Utah radio station on Friday afternoon to answer questions as to why I think Utah was designated to be a “hostile” state in the JH 15 literature. The bigger questions remain: When will this military snap exercise, known as JH 15, actually go live? And will there be a false flag event which will serve as a precipitating event? When will real Americans begin to disappear? There is one question that can now be answered as we at least we now know why the NDAA was passed.